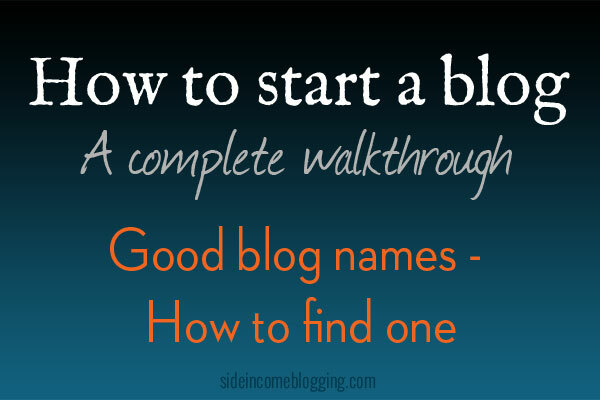 One of the key decisions you’ll make as part of the how to start a blog process is finding a good blog name. The blog name you choose will stay with your blog for a very long time. Your blog name, much like the name of a store or company, is what people will remember. The name of your blog becomes it’s brand. A 4th and somewhat debated criteria is that the name should contain the primary keywords your blog is targeting. Let’s say that in the process of finding our blogging niche, we decided on: Diabetic Recipes. The ideal domain name for our blog would be: diabeticrecipes.com. One of the many things that Google considers when ranking your site is whether the keywords for the search are contained in the domain name for the site. Domain names contain just the keywords are called Exact Match Domains (EMD), and domain names that contain you keywords plus extra words are called Partial Match Domains (PMD). Using EMDs and PMDs is a bit controversial, because Google has recently cracked down a little on “exact match domain names”, which is exactly what diabeticrecipes.com is. That domain name is an exact match of the target key phrase. Google specifically targeted various industries and specific keywords, no all exact match domain names, so in most cases you’re safe. I still use exact match and partial match domains for my sites. Will using EMDs and PMDs hurt you? Most likely not, but they won’t help you anymore like they have in the past either. Many bloggers are using “brandable domain names” now instead, just to avoid the risk. Personally, I try to find a balance, where the name is both “catchy”, easy to remember, and contains your keywords. This is how I came up with Side Income Blogging. Your blog’s name and domain name go hand in hand, and should be the same. So assuming for a moment we want t0 call our site: Diabetic Recipes, the ideal domain name would be diabeticrecipes.com. This domain name fully contains the name and uses a .com extension. .COM domain names are trusted and are the one’s people default too. You should always try to get a .COM if you can. If you cannot, using a .NET domain name should be your second choice. Going back to our example, assuming diabeticrecipes.com isn’t already reserved, it’s ideal. The name contains the keywords we are targeting, it tells the visitor exactly what to expect and the blog name is easy to remember. Now, here’s the problem. Chances are, the domain name is already taken. When that happens, you have to get creative. Again, these are just a starting point. Pull out Evernote or grab a sheet of paper and get creative. See what you can come up with. You can also use a few online tools to help as well. I use MyDomain to manage all of my domain names and on their main page, you can enter your desired domain name. If the domain name is taken for any extension, MyDomain will show you alternatives to consider. Tip: Keep the important search keywords at the front of your domain name. While in some cases you may need to add words at the front, avoid doing this if at all possible. Keeping keywords at the beginning of your domain name will help you rank higher for those keywords. Do not, and I repeat: DO NOT use a domain name that contains hyphens. It will hurt your ranking ability, and is not easy to remember. Once you have your name selected, it’s time to buy the domain name. I highly recommend managing your domain names with a different company than who you plan to host through. Why? At some point down the road you’ll most likely want to change hosts and having your domain registered with a different company, and more specifically a company that specializes in domain registrations, makes changing hosts down the road much easier. Again, I use MyDomain, but there are many other companies out there. Many hosting providers, like BlueHost throw in a domain name for free. Free is a bit hard to turn down, so if you want to go this route, keep your domain name with the hosting company until it’s up for renewal, then move it to domain company like MyDomain and GoDaddy then. Search for discount coupons. Most if not all domain registrations have coupon’s floating around that will give you 10% – 15% off the registration cost. Every bit helps. Don’t make the mistake of getting hosting with the domain company. Hosting is not their specialty and you’ll generally get a slow server and poor support (your mileage may vary). Now that you have a domain name, it’s time to get your blog hosting plan set-up or head back over to the How to start a blog page to see other steps. Filed Under: How to start a blog? Would you still recommend that we put our key words in the site url, considering Google’s latest exact match algorithm changes? NE, the changes Matt Cutts referred to were directly targeted at “low quality” sites. Meaning, if you had a site that Google considered low quality, but was ranking high on SERPs due to the domain name being an exact keyword match, you were still ranking high on SERPs. The recent change fixed that issue, and per Matt affected less than .6% of US sites. Yes, I would still recommend putting your keywords in your url. Just make sure your site isn’t low quality – which you would of course want to be sure of regardless. That’s excellent news – thank you so much for the quick response!